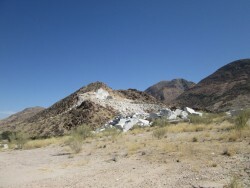 A 54 000 hectare marble concession for sale in Namibia. Concession holder is looking for a Joint Venture partner or a 100% buy out. The concession is located in an area rich in white, grey and black world-class marble. The initial prospecting has already been done whereby samples were collected and verified. The marble concession borders 4 marble mines. The area is located 180 km from the harbour, whereby good road networks and road infrastructure are already in place. EPL 5555 is located within the Southern Central Zone (sCZ) of the Damara Orogenic Belt. Rocks of the Abbabis metamorphic complex underlie the area. These rocks consist of various metasedimentary rocks, paragneisses, orthogneisses, pegmatites and orthoamphibolites. The Karibib Formation comprises of a succession of white to bluish grey, well-bedded marble units containing thin interbeds of quartzose cal-silicate. Near Karibib, large reserves of white, reddish, brownish-yellow and grey marble of dimension stone quality are present. Early settlers initially attempted to quarry Karibib marble in the early years of the century when the koloniale marmorsyndikat was founded. A couple hundred tons of high-quality marble were produced and shipped to Germany. With the outbreak of World War I, production stopped. After World War I, various companies mined marble in the Karibib area. Marble from this locality was used as building material for the old narrow gauge railway line in colonial times. The quarrying of dimension stone marble started in 1988 with the establishment of a quarry face. During the first year, 10000 t of marble blocks ranging from 17 to 20 t in weight, were quarried using the diamond wire-saw technique with a yield of more than 300m3 of marble per month. High quality blocks were exported via Walvis Bay, mainly to European markets, but also to South Africa.